Last year we were really excited for the release of the Scott Pilgrim vs The World video game. 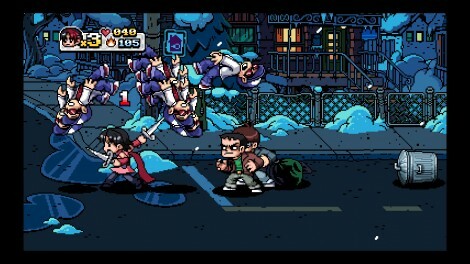 Amazing art style, great soundtrack, and influenced by one of my favorite beat-em ups, River City Ransom. However, playing SPVTW was a bit of a chore, and let’s face it, that whole genre needs some help. Ever since the classic arcade games of our youth it has struggled to gain new life, while Castle Crashers came close, I think we’ve been drug back down since Incubus now has their own beat em up. Good but not quite enough. We have brought together our complete lack of game design and development experience to throw out the best and worst features of beat-em ups to identify and fix the issues. I think Castle Crashers did a great job of maintaining an old school feel while incorporating modern day mechanics, which is why it was successful. While I loved Final Fight, it is tough to play now because of how linear the gameplay is. I’d like a choice as to what alley I go to to pick a fight or what boss is next on my hit list as opposed to being steered in a certain direction. Castle Crashers gave some control over where you planned to go next, but didn’t create a combat sandbox (though that might be cool). I think another big difference between the days where beat em ups were huge and today is the desire for progression and customization. While I liked playing as Mike Haggar, I’d loved to make my own character and arrange moves/ attributes how I desire. Castle Crashers did a good job with this by giving you a choice of weaponry and letting you determine how you leveled up.One thing I do think is important is having randomn weaponry lying around. Hand to hand combat is fun, but being able to knock someone over the head with a golf club or baseball bat is even better. Should limbs fall off during the course of battle, those should be acceptable weapons too. No guns though, these are street rules and guns are for babies.I think it’d be sweet if the beat’em up was almost an MMO, and you could join gangs and battle for control over a city. Could you imagine the scenarios that would play out? WARRIORS, come out, come out where ever you are. 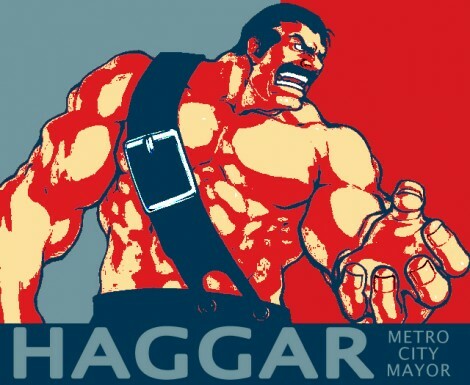 The Hope lies with Haggar... maybe. I will say that I am very excited for the new River City Ransom. In my humble opinion, it is the best beat-um-up game made in the classic console generation. I think there are still a lot of mechanics that make that game playable to this day. I think the key element that would be needed in a new beat-em-up IP would be a mild RPG system. The need to eat, read, and buy smiles in River City elevated that game to a very high level. The controls for that game were also fantastically smooth and easy to pick up. The game also had the difficulty progress in a manner that seemed fair and appropriate based on your location in the game. I think these keys are fundamental for a new game. Now, I’m not sure what direction for scene we should go for in the new console age. I would be very willing to play a sci-fi based beat-em-up. Hell, imagine if Issac Clark was the star of a beat-em-up? A world like that might be pretty cool. 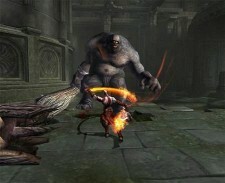 Are games like God of War and Devil May Cry the new beat-em ups? While I agree some RPG elements would help broaden the classic games, part of their appeal was their simplicity and I think the Double Dragons have more to learn from Kratos than Fallout. The last time Billy and Jimmy were around it was Bailey and the Chairman. The trick is to find a formula that is simple, without being overly repetitive, and to reduce the linearity. That was definitely the strength of Castle Crashers, as you were able to at least feel like you had the ability to choose your next stage, or go back and replay others. While that game did a great job of encouraging players to level up, it did become a bit of a grind. I was going to bring up TMNT and The Simpsons‘s arcade machines if nobody else did. I think one of the reasons that these games have fallen somewhat by the wayside is because of the direction gaming has gone as a whole. Back then people actually went to arcade’s to hang out, play games, watch other’s show off their best joystick moves. These days those scenario’s don’t exist in public places for the most part, but they do exist at home when gamers gather, or even better, play online together. I think I’d love to see a brawler that takes place in a larger city where not everyone needs to be on the same screen at the same time. Let me run into a shop to pick up a bazooka while my buddies outside keep the baddies at bay! I am late to the game, but I will confess: I have never played River City Ransom. Ever. Aside from Giant Bomb, I don’t even know what it looks like. On the other hand, I’ve gone back and played Golden Axe quite a few times and, except for how amazingly SHORT that game is and the multitude of re-skin the same sprite enemies, it’s still fun if completely linear. I had a blast with both Castle Crashers and DeathSpank, but I think Ethan and Justin L. are on to something that although they did pick up RPG-based depth which added to the experience, they did turn into a grind a little bit. As much as playing co-op was fun, I think playing any new beat-em-up unless you’re all on a couch in the same room really loses something in the translation; I loved having people hovering behind you or yelling at you for eating the pizza when you had full health or…whatever. I think the closest experience we have right now (aside from the aforementioned games) are Horde-mode type co-op opportunities; that kind of experience reminds me more of The Avengers game (socially/experientially) at the arcade than playing multiplayer Castle Crashers online. I think one trick to finding new life for the genre is remembering that if you’re going to stay simple, the game needs to be short. 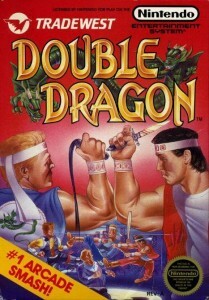 If you play straight through Double Dragon, it’s, what, a couple hours, if? We’ve gotten used to 40 or 60 hour campaigns in Cyrodiil and the Old West without realizing that side-scrolling beat-em-ups don’t translate well to that length. 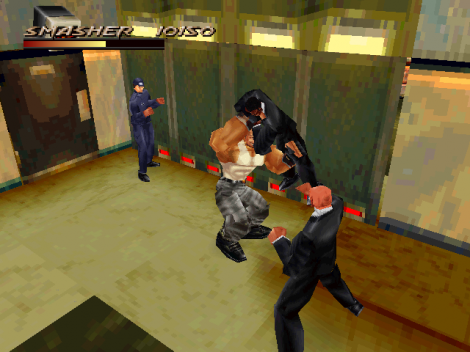 I think that in today’s world that defining what a beat-em-up is can be very difficult. I look at Darksiders, Dante’s Inferno, & Marvel Ultimate Alliance as the modern beat-em-up. It seems as if the Metroid-Vania genre had a child with the old school beat-em-up and this is what we have now. As of right now, I think the only true beat-em-ups are arriving via XBLA or PSN. I guess that begs the question, do we bring back the old school form of beat-em-ups, or do we continue to progress the genre in the direction that it is going? My favorite old arcade beat-em-ups were the two Dungeons & Dragons games. They had 4 player co-op, branching paths, xp, loot, spells, and deeper combat than most. Besides RCR, it seems most games shied away from those deeper elements. If more games tried to add some depth and evolve the gameplay, maybe the 2D beat-em-up, or maybe the perspective as a popular choice on the whole, would have remained viable into the 32bit era. Games like Fighting Force were fun enough, but can you imagine what the world would be like if developers had kept making more side scrollers with much higher resolution 2d art, and mechanics beyond “mash these two buttons and keep feeding me quarters”? Does anyone other than Josh remember this game? Luckily for us, companies like The Behemoth are creating a renaissance. Dungeon Fighter Online is a love letter to those old D&D games but in MMO-lite form, and this fall Vanillaware will show us their take on the genre with Dragon’s Crown and its gorgeous hand-drawn art. The younglings even got a taste of the old school recently with Batman: Brave and the Bold on the Wii. 2D perspective, beat-em-up combat, two player co-op and quite good to boot. Like Justin, I wouldn’t mind seeing some more co-op/team-up moves in these games e.g. The Simpsons. Time for a five player Voltron game! I ask you all, why do we need modern day beat em ups? It is a tired genre that succeeded in the earlier days of video games because the technology just wasn’t there to do a whole lot else. Beat em ups were designed to eat quarters at the arcade (which they did quite successfully) and even though some games made a successful translation to the home console, there just wasn’t much depth. As far as modern day beat em ups go, most action games have that element. Justin L mentioned God of War and Devil May Cry. I’d go so far as to mention Batman: Arkham Asylum in that same breadth. Granted Batman has way more depth than a regular beat em up, but that’s what you all seem to be clamoring for in an update to the genre. Just because fighting games (Mortal Kombat and Street Fighter) have made a comeback doesn’t mean we need to bring back all of the old classic genres. Bringing back the classic beat em ups in a retail boxed copy seems ridiculous. Let them live on PSN and XBLA (which is a good place for them). That genre is only good in quick hits, it doesn’t need to be full length game. If it is, we’d just complain about the repetitive gameplay anyway and put it down after awhile. Even if there was co-op. Is this the new face of the beat em up? I don’t know if we NEED a modern day beat em up, but it would be sad to see the genre die. There’s something to be said for keeping the idea behind them alive while giving them a new coat of paint. It comes down to mechanics, and if we can look at the simplicity that came from necessity and add depth to that to match modern day expectations, then we can keep the pieces that people loved. Simple or not, platformers were created for much the same reason and still persist, though in much different and advanced forms. We just shoot so many bad guys, why can’t be let our fists and feet do a bit of talking? I’m with Ethan. I had all but given up on the fighting genre, but this industry is cyclical and I have a lot of nostalgic ties to the beat em-up genre. Seeing Castle Crashers and Scott Pilgrim fall just a bit short of revitalizing it, just teased me. I think we’re right that other games like Arkham Asylum, DMC, God of War, etc have modernized it a bit, yet it doesn’t feel like home for gamers that just want to go punch some street thugs who stole their girl. It may be an impossible and unplayable request.I’m with Ethan. I had all but given up on the fighting genre, but this industry is cyclical and I have a lot of nostalgic ties to the beat em-up genre. Seeing Castle Crashers and Scott Pilgrim fall just a bit short of revitalizing it, just teased me. I think we’re right that other games like Arkham Asylum, DMC, God of War, etc have modernized it a bit, yet it doesn’t feel like home for gamers that just want to go punch some street thugs who stole their girl. It may be an impossible and unplayable request. This is where I retort and say beat em ups will be revitalized with WWE Brawl (sarcasm). But couldn’t some of us get our beat em up fix from wrestling games like WWE All-Stars or is that to singular for the likes of you? Ya that’s has more in common with a fighting game than a beat em-up. Just speaking from the part of MY brain that defines difference, your brain may be different. I want new side scrolling beat-em-ups for the same reason that I want new side scrolling platformers, side scrolling adventure games and side scrolling shmups. I have extremely fond memories of those genres and their games, and I still enjoy many of them today. WWE All-Stars and God of War are great games, but they are not “beat-em-ups” in the sense that we are talking about and don’t scratch the specific itch that I have. I’m not tired of the genres, but I have played so many of those games so many times that I want new content. I’m ok with the future of the genre living solely in downloadable form, but don’t think for a minute that there isn’t room in the market for these games. Naysayers, can talk to my brothers Billy and Jimmy. Can Dragon's Crown bring back the genre? Josh, how have the younglings at NetHeads responded to side scrollers in general? Do they dismiss them or give them a chance? Castle Crashers is a very popular game with the kids here. We suggest it all the time and rarely do they not give it a go. I’ve never heard them say “Eww! Where’s my polygons? !” either. They just enjoy the gameplay and humor because a good game is a good game. I think so many of them have spent countless hours playing flash games on their parents’ computers, many of which are side scrollers or just 2d in general, that they don’t really have an aversion to the style. 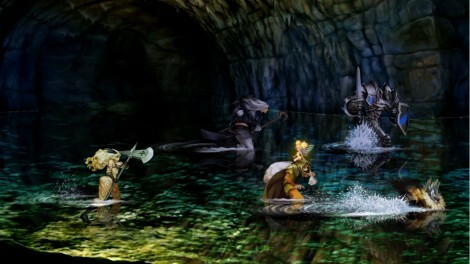 The DS is home to a plethora of side scrolling games, as well. The fact that Nintendo recently made two new Mario games in the traditional style says a lot. I think you have to be pretty DudeBro to hate side scrollers on sight, and most kids ’round these parts just aren’t like that. Well we certainly didn’t solve any of the problems that have been facing the genre. We didn’t really even come up with good ideas. We might have to wait and see what VanillaWare is going to do with Dragon’s Crown to see if it can revive the genre. In the mean time maybe we take a look at the indy scene to see what we can find. was fighting force on dreamcast? and you can use trash cans and stuff? my favorite beat em up are the newer xmen games.